The Peggy Kirk Bell Girls’ Golf Tour hit the highway, with the National Series traveling up Interstate 95 for a weekend of Mid-Atlantic madness with our northernmost members at Bulle Rock Golf Course in Havre de Grace. Back in the south, the weather got the best of the North Carolina Regional Series while the Southeast Series tasted a Division 1 challenge in Athens. 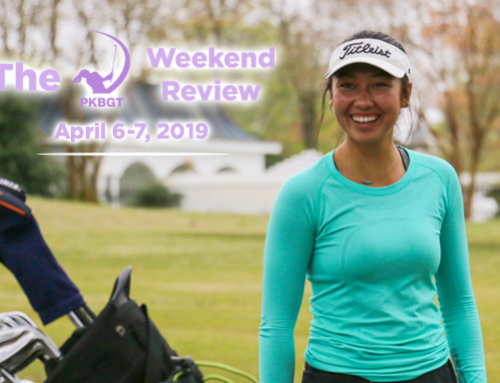 Fight off the crabby Monday blues and relive the top moments from Maryland in this edition of The PKBGT Weekend Review! Standing on the outdoor patio deck of Bulle Rock’s bar and grill, you gain a bird’s eye view of the craftsmanship in the Pete Dye course design. Shaped in eloquent fashion, the course highlights Havre de Grace’s sheer beauty by transforming the natural elements into obstacles that challenge the highest level of competitive golfer. Rolling hills engulfed in the shadows of towering trees outlining the perimeters seldom leave players with a favorable lie. Bunkers positioned brilliantly in the line of sight on every shot and winding greens force players to contemplate whether a risk is worth the possible reward. Dye’s careful intertwining of natural beauty and challenge is best exemplified when raised above the grounds, overlooking the exquisite 18th hole. An elevated final tee shot stares down numerous vexing traps biding for a breakdown on the last hole of competition. An intricately assembled wall of “Bulle” rocks edge the left side, separating the fairway from a channel of water, a daunting penalty area. For players hoping to avoid a disastrous result to close out the round, the fairway bunker off to the right may strike them as the more appealing landing zone, a better position for damage control. The course presents a stiff challenge to the world’s most elite golfers, having served as the former home of the McDonald’s LPGA Championship for five years from 2005-2009. On a calm, clear day when you can see the ball for miles, Bulle Rock is a force to be reckoned with. When Mother Nature tosses a curveball in the form of dense fog blinding players of the fairway on the first tee, the challenge takes on a new form. At 8:45 a.m. Sunday morning, those were the very conditions the first group encountered. Facing a blind tee shot into the hazy abyss, players relied on a group of spotters positioned off the side of the fairway to locate their drive. 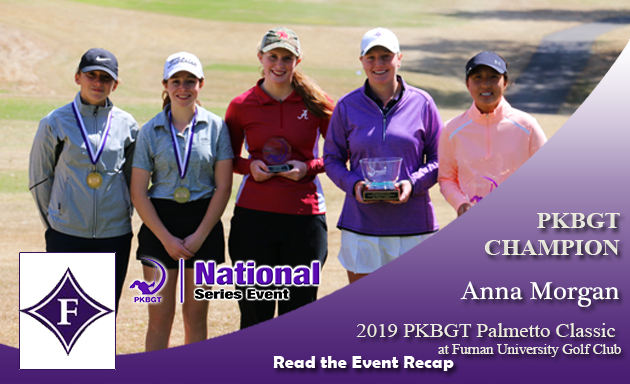 The PKBGT backs down to no challenge and within an hour the deep fog lifted, smooth sailing for the final nine holes of the 2019 PKBGT Mid-Atlantic Girls Championship. 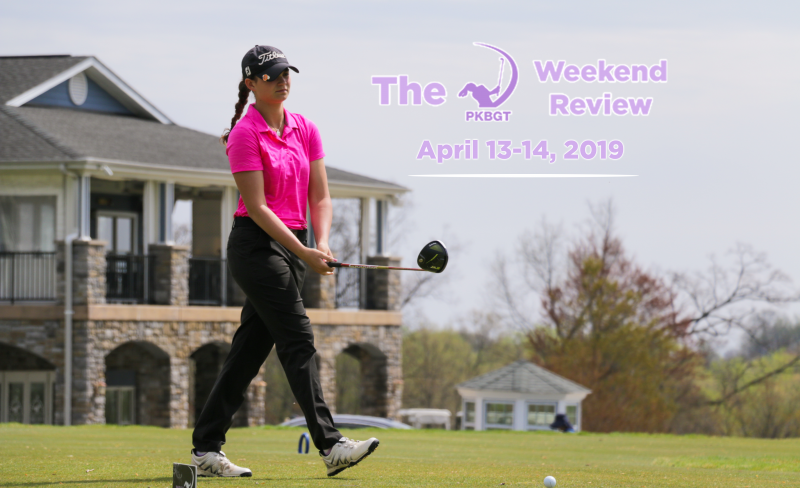 In partnership with the MAPGA and MSGA, a weekend in Maryland served as a showcase to the tour’s top talent from the northern region of the east coast. Aside from Sunday’s brief re-creation of the 1980 thriller “The Fog”, conditions were fair and the girls showcased their talents, paying homage to the great’s that walked the course before them. Haley Quickel (Middletown, DE 2020) left the course on Saturday evening trailing the lead by one stroke in the Bell National division. Closing the afternoon with a one-under-par 35 on the back nine, Quickel’s momentous run would not be stifled by a night’s rest. She scoffed at the fog’s feeble attempts to squander her success from the previous round, opening Sunday with a birdie on the first hole. The point of no return, Quickel spent the remainder of her final round gazing ahead to the 2019 PKBGT Mid-Atlantic Girls Championship just off in the distance. Gradually pulling away from the field, leaving them a fading image in her rearview mirror, Quickel closed out her weekend with an even-par 72 on Sunday. Her two-day total score of 73, 72 = 145 (+1) was best in the field as she walked away with champion honors. 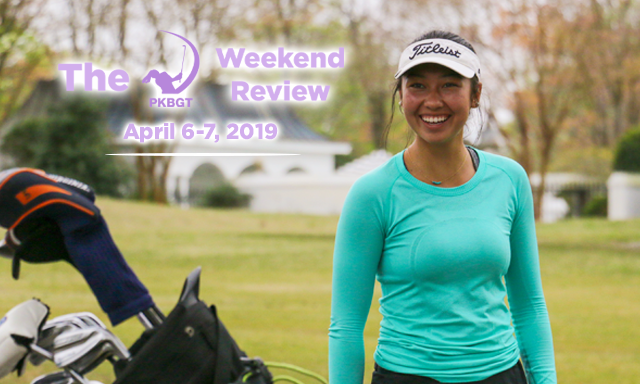 Unlike the razor-thin margin in the Bell National division following the first round of play, Josephine Nguyen (Springfield, VA 2023) held a considerable lead entering Sunday morning’s final round of play. Fully aware of the competitive nature of PKBGT events, Nguyen understood that no lead is safe and that she would need another stellar performance to walk away with the PKBGT glass bowl. Nguyen opened to a rocky start on Sunday with bogeys on three consecutive holes. She regained her composure with a birdie on the par-three seventh hole, balancing out the bogeys with back-to-back pars to close out her front nine. For the remainder of the afternoon, she made the right plays and performed at a level high enough to fend off the surging field vying for her top spot. Nguyen finished her weekend with a two-day total score of 74, 79 = 153 (+9) and the 2019 Mid-Atlantic Girls Championship in the Futures National division. Miss out on the action this weekend? Catch up with the full event recap HERE! On Sunday, April 14, 13 of the Southeast’s top rising talents took to the University of Georgia Golf Course for the inaugural Junior Collegiate Showcase! Presented by Girls Golf of Athens and GG Golf, the event was a true Division 1 challenge. In the three days prior, the course hosted the 2019 NCAA Liz Murphy Collegiate Classic, a Division 1 golf tournament featuring some of the top collegiate golf programs in the nation. On Sunday, the inaugural event gave junior golfers a chance to play the exact tees and pins that the collegiate teams competed at in the final round of the classic. Ashley Looper (Marietta, SC 2019) earned the trophy as champion of the inaugural event after posting a score of 82 (+10). The top moment of her round came with a birdie on the par-four sixth hole. 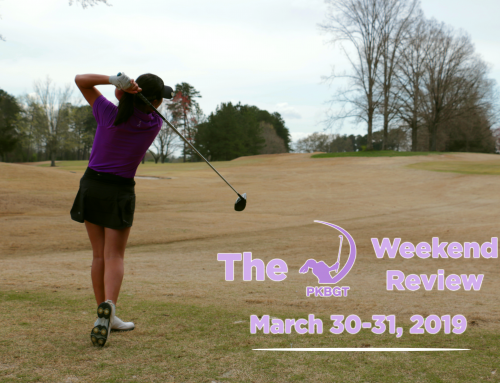 Finishing just one stroke back of Looper, Hailey Han (Duluth, GA 2025) finished the round with a score of 83 (+11). At just 12 years old, Han gained the worthwhile experience of a collegiate challenge that she will take with her moving forward throughout her golfing career. Taking on the true collegiate test in her hometown, Meredith Bennett (Athens, GA 2021) finished in third place after shooting 84 (+12) on Sunday. Rounding out the Top Five in a two-way tie for fourth place was Madi Chappell (Bogart, GA 2021) and Reagan Folk (Madison, GA 2024), both finishing with scores of 89 (+17). View the complete leaderboard from Sunday’s event in Athens HERE! 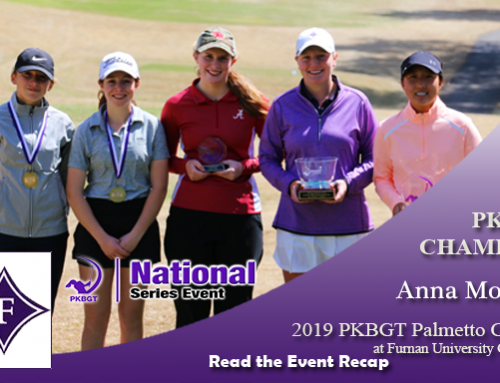 Rainstorms throughout North Carolina put a damper on the weekend and forced the cancellation of the PKBGT North Carolina Regional event at Monroe Country Club. The event was scheduled to take place Saturday, April 13. The tour is working with the course and will keep everyone updated on a potential reschedule date. With the PKBGT National Series just past the halfway mark, we take a look at how the Order of Merit rankings stand across the board in the Bell National and Futures National divisions! 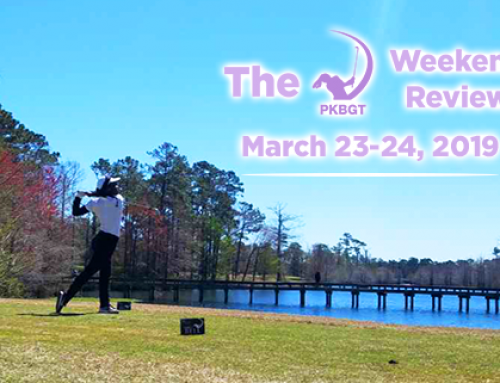 The PKBGT splits up the Carolina’s this week with a pair of qualifying events. 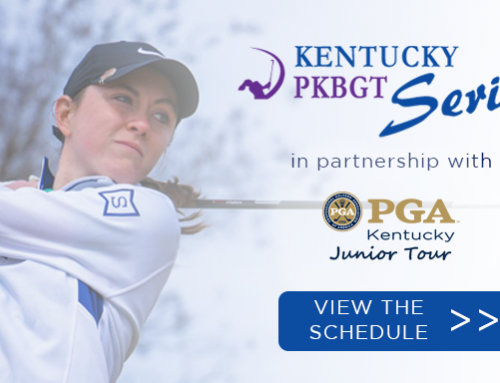 Members in North Carolina will play the 2019 CGA-PKBGT Vicki Disantis Qualifier at Siler City Country Club. 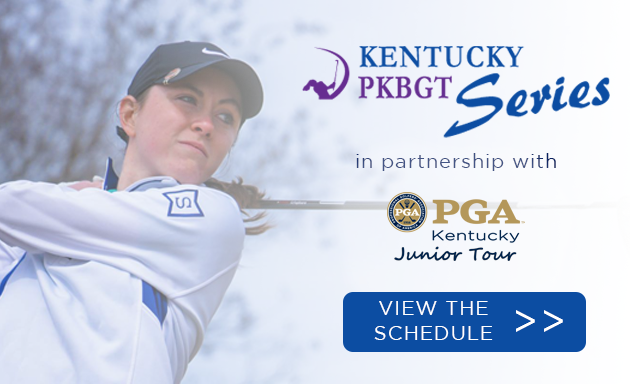 The 2019 CGA-PKBGT Vicki Disantis Qualifier at Green Valley Country Club will serve as the qualifying event for members in South Carolina. 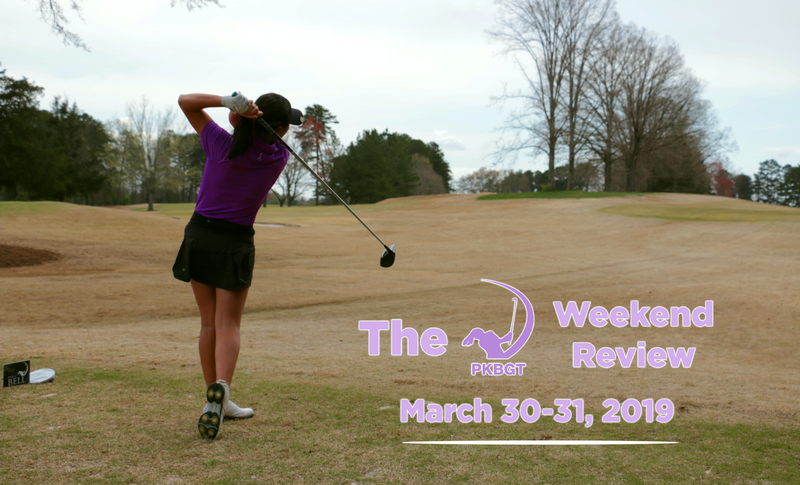 The events serve as an opportunity for players to qualify for the CGA Vicki Disantis Girls’ Championship at Pine Island Country Club in Charlotte, NC from May 11-12, 2019. They also serve as opportunities to earn a spot in the 2019 PKBGT Tournament of Champions. 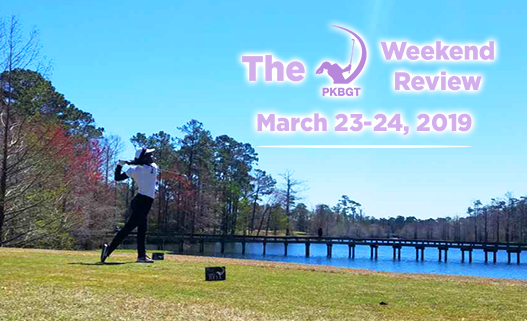 The National Series takes the weekend off, but the deadline to register for the 2019 PKBGT Carolina’s Classic is TONIGHT at 12 a.m.